Thanks to Maurice for having researched this one in some detail. The alternate route to Madeira may be required if airlines flying to Madeira cease their services as often as they have just this week! – see Germania and Thomas Cook on previous posts. The island seems to be running out of airlines that want to come here. Maurice has unearthed a method of travel between mainland Portugal & Caniçal on the container ship Funchalense 5. 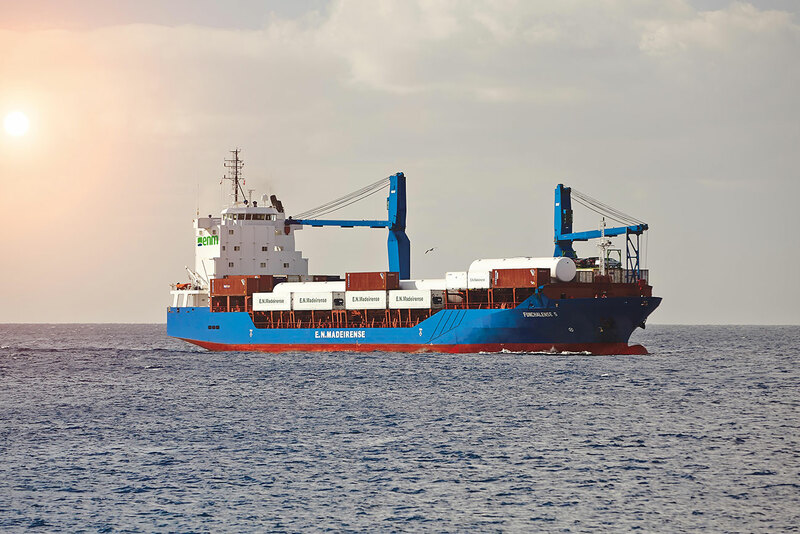 His enquiry with Empresa de Navegação Madeirense has revealed the possibility of travelling on the cargo ship “Funchalense 5” between the ports of Leixões, Lisbon and Caniçal. ENM are part of the Sousa Group, which operated the much-awaited passenger ferry between Funchal and Portimao that finally returned in its latest manifestation last year. The cost of the voyage in a cabin is €140/person/trip (meals included). According to the information sent to Maurice, travellers are required to provide only basic information, including phone number, address, and a copy of their ID card/Passport. Travellers are also required to take out Personal Accident Insurance,” the sole responsibility of the passenger, specific to cover risks and civil liability for the sea voyage, in container ships, between the intended ports”. Can you take a car? The photo is of a different ship of the line. Funchalense 5 does a regular circular run on a 7 day cycle. Not sure how many passengers the ship can take. Maurice – found a photo of the Funchalense 5, which I have replaced above. Let’s hope things don’t get so bad that we have to go to these lengths to get to our timeshare! Like most things, Brexit will hopefully “sort out” one way or another. 12 passengers is the maximum legal allowance on any non passenger ship, after that a different safety certificate has to be issued under SOLAS ( safety of life at sea) regs. and , in essence , the vessel has to comply with passenger ship ( ferry) regulations for number of lifeboats etc – a very costly business. I doubt whether the Funchalense 5 would have the accommodation for more than a couple of passengers at present to be honest. All the more reason for an all year round ferry service between Madeira and Lisbon ( as discussed on this blog previously) to be set up. It’s good news for those who don’t want to fly ! Doberman might be interested in this. Great story!! Won’t solve problem of getting tourists to Madeira but could be fun if you are not prone to sea sickness. Cruising on freight ships is not well known but, from what I have read, is a worthwile experience. The quality of the cabins & food is supposed to be as good as the best cruise ships and with only a few other passengers you are, effectively, on the captain’s table every night. I am guessing that the cabins & food are fine. You get some strange looks when some one asks how did you get here. They reply container ship.